As a focal point of national quality initiatives, meaningful use (MU) is unfolding across the industry as a strategic effort to increase the momentum of health information exchange (HIE). The initiative accomplishes this goal by progressively laying a foundation of attestation requirements for the collection, exchange, and reporting of data using certified EHR technology (CEHRT). As the MU timeline matures, the stakes for meeting attestation requirements become increasingly high. More rigorous requirements related to HIT terminology standards are introduced with each stage as critical steps to positioning the industry for accurate and consistent exchange of patient information. The adoption of such industry-respected clinical vocabularies as RxNorm, SNOMED CT, and LOINC provide the needed infrastructures for improving communication between disparate IT systems, enabling better sharing of critical patient data and ultimately leading to better decision-making and outcomes. 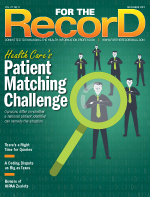 While the burden for designing infrastructures that meet CEHRT requirements rests with the vendor community, it's important to note that solely adopting a certified EHR does not qualify a provider to receive incentive payments. Providers must successfully attest to MU of the certified EHR. The interoperability challenges for attestation go much deeper than what is provided by the CEHRT. For example, the burden of integrating structured data from systems outside of the CEHRT rests with the provider. Going forward, providers will need to implement enterprise terminology management strategies to comply with MU terminology standards and to advance interoperability. It's a complex undertaking for the average resource-strapped IT department. For this reason, many facilities are turning to advanced technology and automation to lay a foundation that supports semantic interoperability and MU compliance. As each stage of MU is introduced, the industry gains more opportunities to foster information sharing. In stage 1, the industry goal was to increase EHR uptake and support basic electronic capture and tracking of patient information. Stage 2 attestation requires greater use of the data housed in EHRs for more rigorous HIE and advanced clinical processes. With each stage, providers face new compliance challenges. For example, to support stage 2 goals, the industry must meet much higher thresholds for the use of specific vocabulary standards such as SNOMED CT, LOINC, and RXNorm, quality measures reporting, and cross-enterprise interoperability. As the requirements for stage 3 and beyond are introduced, the stakes will become higher as heightened expectations and requirements for the use of clinical decision support to promote improved quality, safety, and efficiency are laid out. Expectations for each MU objective will increase, as will the number of measures providers must calculate. To position for success, health care organizations must implement the correct infrastructures to achieve attestation the first time or risk losing sizable incentive dollars. Effective terminology management to support semantic interoperability is critical to long-term success in the MU program. Patient information, which is spread across multiple communities and IT systems, often contains various terminology platforms—from clinical and administrative to those based on standards or localized clinical concepts. These disparate terminology lexicons must be normalized into a standard language so that the meaning of the clinical data is unambiguous. Even when these ancillary systems are using standards, terminology management strategies often need to ensure interfacing systems are all using the same version of the standard. Currently, EHRs are the only systems "certified" to meet these new requirements; this presents notable semantic challenges to health care organizations receiving clinical terminology from disparate systems. To comply, infrastructures must exist that allow data to be collected and aggregated from other noncertified clinical systems such as laboratory, formulary, and legacy systems. For example, consider the interoperability requirements of transition of care. In MU stage 2, providers must deliver transition of care records as patients move to other care settings. The certification process ensures that the EHR technology can receive a limited set of data elements and codes. In practice, patient information is complex, and the data that need to flow into the EHR are typically much broader than what is validated during the certification process. During attestation, the provider is held responsible for mapping data to standards to ensure all data flowing into the CEHRT are useable in a meaningful way. Further, the EHR is not required to generate structured coded data according to the standard certification process. Providers must map internal EHR codes to standards for transmitting those data to interfacing systems. Achieving MU goals requires health care organizations to implement strategies to ensure that all enterprise systems are compliant with terminology standards. The implementation of a clinical terminology master data management strategy enables the creation of a single, integrated, and trusted source of terminology across an enterprise. A clean, normalized data set ensures departmental systems are relying on approved and up-to-date terminologies, maps, and value sets—a prerequisite for today's HIT environment. In addition to ensuring the enterprise is up to date with the latest standards, providers must be certain that custom content is authored in a consistent manner, and value sets and code groups used in quality measure calculations are current. To achieve this undertaking, a provider's terminology management strategy must include capabilities to map legacy data and local codes to terminology standards. Health care organizations should make terminology mapping a priority when devising and implementing an infrastructure to support industry standards. Solutions that support automated mapping functionality alongside Web-based support for manual mapping are wise choices for ensuring accuracy and workflow efficiencies. Functionality that allows for the seamless integration of automated mapping algorithms into enterprise systems with the ability to normalize full catalogs or distinct elements from disparate systems into standard terminologies will help position organizations for long-term success. Because ongoing standards implementation and maintenance is complex, the business case for leveraging the expertise of third-party consultation and an enterprise terminology management platform can be helpful to resource-strapped HIT departments. When a platform of software, content, and consulting solutions exists to map, translate, update, and manage standard and enhanced clinical terminology, the guesswork is essentially removed from terminology management processes. While CEHRT is the first step to MU compliance, the remaining attestation burden falls to providers. To give themselves the best chance of meeting MU objectives, health care organizations must lay infrastructures that will support semantic interoperability between disparate systems. Going forward, MU success will hinge on the implementation of advanced terminology management strategies that support data normalization and semantic interoperability. Forward-looking health care organizations will leverage the expertise of third-party consultation and enterprise terminology management solutions to support automated and reliable mapping of content to industry standards. — Jason Wolfson is vice president of product management at Wolters Kluwer. He can be reached at Jason.wolfson@wolterskluwer.com.